During the 19th century and into the early 20th, many communities referred to their chief elected —or appointed — official not as mayor, but as president. From 1900 to 1909, my hometown, Solvay, New York, had as its president Frederick R. Hazard, who also was president of the area's biggest industrial operation, the Solvay Process Company. This meant that Solvay's first lady, in every sense of the word, was Dora Sedgwick Hazard. It would be difficult to overstate the importance of Mrs. Hazard to the people of Solvay and the surrounding communities. While her husband shared credit for much of the work that shaped the village, one senses that Mrs. Hazard was more instrumental in creating the projects that went beyond the workings of the factory and into the homes and lives of the people who lived in Solvay. Mrs. F. R. Hazard, Solvay Founder’s Widow, Dies in Rhode Island Home Mrs. Dora Sedgwick Hazard, Syracuse’s outstanding woman and widow of Frederick R. Hazard, founder of Solvay village, died Tuesday afternoon at her summer residence, Westmoreland Field, at Narragansett Pier, Rhode Island. Although the philanthropist had been a semi-invalid for a number of years, it was not until three days ago that her condition took a serious turn and it was realized the end was not far off. Death came peacefully at 5:30 o’clock yesterday afternoon. At the bedside were two daughters, Mrs. S. Foster Hunt of Providence, Rhode Island, and Mrs. Martin H. Knapp of Orchard Road, Solvay. Word of her death was received shortly afterward by telephone at the family residence, Upland Farms, in Orchard Road. It was said Mrs. Hazard, despite her affliction, was exceedingly cheerful when she left July 1 for Westmoreland Field to spend the remaining summer months, but that the weather of recent days was depressing and had a part in affrecting her general condition. Apparently realizing that her life’s work was nearing an end, Mrs. Hazard, in recent months, had made repeated requests that her funeral be of the utmost simplicity. Her wishes will be carried out in full. The rites will be conducted at Westmoreland Field Thursday noon by Rev. Dr. W. Waldemar W. Argo, pastor of May Memorial Unitarian Church, in the presence only of immediate members of the family. Her body will be brought to Syracuse Thursday night and will be interred in the family plot in Oakwood Cemetery the following morning. Rites at the grave will be equally simple and with only members of the family present. The family requests that friends of their mother please refrain from sending flowers. ENGAGED in social service and welfare work from young womanhood, Mrs. Hazard since the death of her husband 18 years ago, came to be known as the outstanding philanthropist of the community. Her liberality to various institutions and charitable agencies knew no bounds. Mrs. Hazard’s health began to fail several years ago after the death of Mr. Hazard, February 28, 1917, and for a number of years she had been a semi-invalid and confined when not in bed, to a wheelchair. At rare intervals, however, she got up, and one of the last times was when she went to the Onondaga Hotel ballroom during the 1933 campaign of the Syracuse Community Chest to make a personal appeal. At the time she spoke from her chair. Her activities in the Syracuse Community Chest led members of the organization, at their annual meeting two years ago, to give her the honor of becoming honorarly president. She is the only Syracusan ever to be so honored. MRS. HAZARD organized the Women’s Political Union, an organization devoted to the fight for woman suffrage, and served as its president until suffrage was gained. She was exceedingly active in this organization and led the first grand march of the group from the Kanatenah Club to a mass meeting at the Arena. During the campaign for suffrage, Mrs. Hazard entertained a number of the distinguished leaders in the national unit at her home here. One of her chief interests of late years was the Huntington Club, a patriotic organization which grew out of a wartime enterprise originally called the Girls’ Patriotric League. She had been confined to her bed at all times since last September, except when she was aided into her sedan for short rides. She was driven in her car to her summer home and stood the trip well. Closely affiliated with her husband in their vast philanthropies and other public endeavors, Mrs. Hazard took great interest in the affairs of Solvay during the years of her married life. The village of Solvay grew up around the Solvay Process Company, founded by Rowland Hazard, and for years headed by Frederick R. Hazard. Solvay owes many of its improvements and civic developments to Mr. and Mrs. Hazard. PROBABLY Mrs. Hazard’s favorite charity was Syracuse Memorial Hospital. Established April 26, 1887, as the Women’s and Children’s Hospital in West Genesee Street at State Fair Boulevard, the institution thrived under the leadership of Mrs. Hazard, who served at various times as president and always as a member of the board of directors. It was in the same year that she and her husband founded the Solvay Guild, a charitable instituion that will serve as a living perpetual memorial to their widespread benevolence. The guild was first organized as a sewing school for girls of the neighborhood, but it soon developed into a social service group. Into the guild were merged five groups, or circles, Solvay, Willing, Onward, Friendly and Whatsoever, whose purposes were both educational and philanthropic. The guild, which grew to a membership of 250, studied child health work, started a day nursery in the village and established a hospital fund for needy cases. 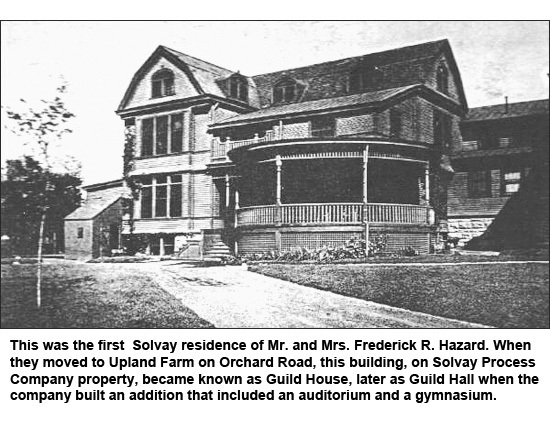 The first Hazard home was turned over to the guild as a club house for the benefit of the Solvay Process Company employes when the Hazard estate was built on Orchard Road. It was through the Guild that the first kindergarten in the Syracuse area was established, which led to the installation of the system in all grade schools and also to the establishment of domestic training and home economics instruction. MR. AND MRS. HAZARD had resided in Solvay since their marriage in 1886. They built their first home when Solvay was little more than a large tract of farm land. Mr. Hazard served as the first village president, from 1900 to 1909. Mrs. Hazard’s indomitable spirit was called upon to near excess on many occasions. When the World War broke out she was one of the first to respond to the call for aid from the women of the country. Dr. Flora Murray, physician in charge of Endell Street Hospital in London, England, a close friend of the Syracusan, asked Mrs. Hazard to recruit 20 young women for work as hospital orderlies. Mrs. Hazard secured 30 applications within a short time and judgment of the fitness of the candidates was left entirely to her. When a committee headed by the late Rev. Dr. Frederick W. Betts began a moral survey of the city some years ago, Mrs. Hazard was one of the first to be consulted. She and her husband were both made members of the committee, and aided both in financing as well as performing administration duties of the committee. Mrs. Hazard carried on the great philanthropic work performed by her husband during his lifetime. Amost every charitable cause was aided by most generous gifts and many drives for funds for such causes received her energetic help as a worked and executive as well. Mrs. Hazard was the youngest daughter of the late Charles B. and Deborah Gannett Sedgwick. She was born August 13, 1864. Surviving are three daughters and a son, Mrs. S. Foster Hunt of Providence, Mrs. Martin H. Knapp of Orchard Road, Solvay, and Miss Katherine Hazard of Cagnes-Sur-Mer, France, and Federick R. Hazard of Saunderstown, Rhode Island. “I had known Mrs. F. R. Hazard since I came here in January, 1882, when I frequently stayed during the weekends at the Sedgwick colony. She was the youngest daughter of Judge Sedgwick. “Since then, during my long connection with the Solvay Process Company and my work with F. R. Hazard — first when he was treasurer and then as president — I have known intimately the great service she rendered to the employes of that company in the introduction of welfare work among employes, the kindergarten in Syracuse and the formation of the Memorial Hospital, in which she and my wife were vitally interested. “Few people realize how greatly Mrs. Hazard will be missed, as so many people have been helped by her without the knowledge having reached the outside world. Her brave spirit persisted during her long illness and she continued to give counsel and help to many people.